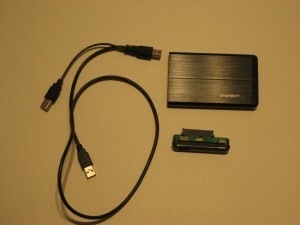 A USB hard disk enclosure is a cheap and simple way to have access to your files from an old computer or laptop. 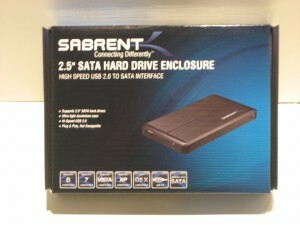 I purchased the Sabrent 2.5″ SATA Hard Drive Enclosure from Tigerdirect for about $10 for my dead laptop. Fortunately, it wasn’t a hard disk failure and our family was able to recover all our old files. Not everything has been moved over but it is accessible for whenever we want it. Enclosures are available for 2.5 inch hard drives used in laptops and notebooks and for 3.5 inch hard drives for desktop computers. Price – 4 / 5. I’ve often seen enclosures priced at $30 plus so I was pleased with paying approximately $10 for this. Quality – 4 / 5. This device is solidly built, easy to set up, and has decent documentation. The only other thing I could ask for would be a less rigid case or cover that could offer some impact protection. It did however come with a little leathery sleeve. In addition it connects with USB 2.0 so it’s not as fast as USB 3.0. Overall – 4 / 5. This enclosure is a pretty good deal and I easily recommend it. Although it lacks USB 3.0, this can be OK if you don’t need the speed for daily use and just simply want to get at your data.